On December 13, 2016, Mortimer Schulz, the founder and owner of solutions in energy e.U., drove from Vienna to Gobelsburg and tasted a young Grüner Veltliner, 2015, Ried Steinsetz, 13.0% vol. alc. 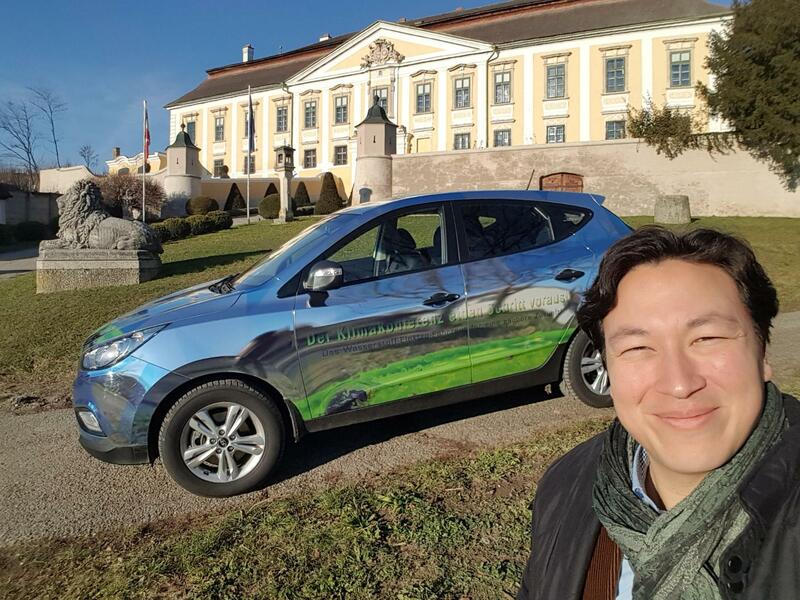 The Vineyard and Castle were reached by driving the FCEV (average 1.5 kilograms of hydrogen per 100 kilometres). The wine-tasting and the FCEV were compared; thereby alluding to the six senses. Emphasis was laid on experiencing the FCEV with all of the senses. The residual by-product “H2O” as was collected in a glass (see middle picture) was not yet tasted this time. Further testing coming up. Thank you Eva Moosbrugger and Katharina Breitenecker for the tasting and delivering a superb wine. Family Moosbrugger operates the vineyard since 1996 and they are a member of the Österreichische Traditionsweingüter.